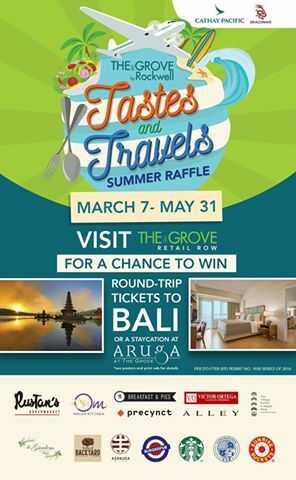 The Grove by Rockwell Tastes and Travels Summer Raffle ~ Philippine Freebies, Promos, Contests and MORE! This summer, treat yourself to a well-deserved vacation for FREE by joining The Grove by Rockwell Tastes and Travels Summer Raffle promo. Every P500 single receipt purchase from any store at The Grove Retail Row or P1,000 single receipt transaction at Rustan's Supermarket entitles you to one (1) raffle stub. Fill out the raffle stub with your contact details then drop off in drop boxes located at the redemption booth at The Grove Sales lounge, The Grove by Rockwell in Ortigas. There will be two (2) draws in the entire duration of the promo. In each draw, one winner (1) will receive two (2) Round-trip Cathay Pacific Economy Tickets to Bali and another winner will enjoy a 3 days, 2 nights staycation at a 2-bedroom suite at Aruga at The Grove. Non-winning stubs in the previous draw can still have a chance to win in the next draw date.